From business cards & letterhead to other business critical documents, pagesetup has decades of experience producing top-quality print material. Connect with us today. From newspapers and magazines, to trade publications and business directories, the print ad is still the number one form of advertising. pagesetup takes in to account you and your business brand, your marketplace, your competition, and your target audience when creating esthetically pleasing and effective print ads. Do your ads concisely communicate who you are and what you do? Are your ads attractive to the eye? Is the call to action clear to your target audience? How effective are your ads? pagesetup can help provide ad creation with your business and audience specifically in mind and we work with your current vendors, or we can find targeted publications that fit your business needs. Print ads from newspapers and magazines can be found at great value in our current market. The effectiveness of the YellowPages often differs by industry and your billboard design should match your overall brand presentation. Learn more about pagesetup ad services by contacting us today. While the logo dates back to the practice of branding animals, the logo by itself is not the only element of your brand. That being considered, the logo is often the focal point of your brand. The number one mistake in logo design is creating too complex of a design that doesn’t transfer well among mediums. A logo that looks great in print may not transfer well to screen printing on t-shirts or embroidery on hats. Your logo should be simple and straight-forward reflecting the image of who you are and/or what you do. pagesetup takes these factors into account when designing or updating your logo. Technology has brought us all a long way; however, it has yet to replace the centuries old standard of exchanging business contact information in the form of a small wallet-sized card, or business card. This exchange of information is more than simply contact info, but is also the first tangible reflection of your company—which is the main reason we emphasize your brand and advocate higher-end business cards when establishing new business cards for a client. pagesetup generally creates full-color, doubled sided (or, 4/4 – pronounced “four over four”) designs that often incorporate high gloss finishes. While these designs can have a relatively minimal affect on cost, they can be invaluable in improving your bottom line by effectively communicating first impressions. Another centuries old component of your brand is your letterhead and envelopes. While not in use today as they once were, they still reflect your brand commitment—the best company brands have customers that are able to identity that a particular mailing is from that specific company just by seeing the corner of the envelope. Think about it like this: most of us know when we get a mailing from our bank even when it’s in a pile of other mail. This is because the banking industry is among the best of all branders and spends hundreds of millions of dollars conducting market research and overall brand investment to ensure recognition. The small form factor of a printed brochure offers more in-depth, yet brief and structured overview of you, your business, and your market offering. This well branded piece of collateral from your marketing arsenal is the ideal way to communicate and entice your prospect into action. pagesetup has extensive experience in producing top notch quality brochures. From neighborhood and parking lot distributions to mailing inserts, a flyer can be a quick way to express your marketing campaign to a narrowly targeted audience. For example, fliers can introduce a new promotion or can help generate traffic to your Web site. Flyers are generally only printed on one side on light weight paper and are more casual than a product slick. Many companies make the mistake of abandoning brand principles when printing a flyer, which is a mistake that should be avoided. Abandoning your brand in any marketing collateral dilutes the brand in the overall marketplace and can confuse people into mistaking the flyer for one originating from a different company. Often more formal than a causal flyer, a product slick is found at trade shows, proposal inserts, or displayed in an office environment and is often printed on a heavier weight paper. Much like an unfolded brochure, the product slick acts as a way to briefly describe you, your brand, and your offerings or marketing campaign in a structured and esthetically pleasing manner. It is also a good method of differentiating a product or service offering from your regular or typical offerings, or as a part of a special marketing campaign or promotion. As part of any good marketing strategy, referral cards explain to your current client base and prospects the value of utilizing your products or services. The referral card also acts much like a business card in that it should contain comprehensive contact information and introduce you and your company via your brand. With today’s busy lifestyle, a well branded postcard can be a more effective mailing method than a marketing letter. Not to mention the postal rates, postcards can also be more cost effective than a mailing. If this is part of your marketing strategy, let pagesetup help design an effective and highly targeted postcard campaign. There’s no better way to express your customer appreciation (and to keep you on their minds, or create brand awareness), than a thank you card. Often used after a major purchase or as part of an effective referral program, thank you cards can go a long way to improve and ensure a high level of customer satisfaction. Other event cards such as holiday cards, invitations, or certificates designed in a highly professional and brand-centric way can be ideal customer touch points to keep your brand at the top of their minds. 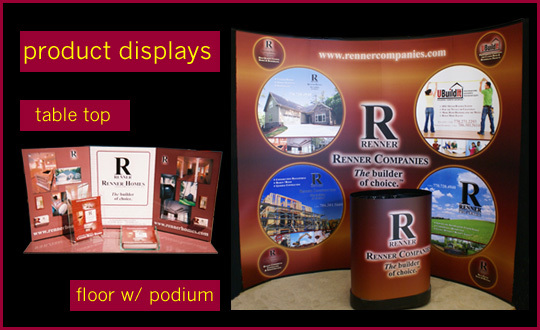 Product displays, or “trade show displays,” range from custom modular designs to affordable and easy to use table top displays. There are a great variety of product displays from the sleek Alumalite 10 ft. to 20 ft. displays to the more practical one-step installation displays, as well as tabletop displays, banner stands, counters, kiosks and many more. Often times pagesetup is often far more competitively priced than in-house services, saving exhibit users thousands in creative fees. pagesetup has the experience to create a highly branded and professional display unit for your next trade show or exhibit to help make it the most profitable and successful that your organization has ever attended. Connect with pagesetup today to learn how to create effect print media.